work I will switch to using squid. Yesterday I travelled to work via England and the Middle East. Or that's what it felt like. I caught the train from Arncliffe. As I walked up towards the station along the eastern side of the railway line I came across a small park. 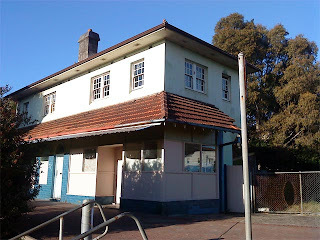 At the end of the park, at the beginning of the footbridge to the station, there was a disused kiosk. The kiosk, footbridge and station buildings themselves looked like they were transplanted from somewhere in England. When I arrive at the station entrance the scene changes. Schoolgirls in headscarfes and olive skinned schoolboys mill noisily near the steps. The shops lining the road to the west of the tracks are adorned with Arabic script. A clothing store sells Arab fashions for women. As I wait on the platform for the train, surrounded by people of Middle Eastern, Asian and European descent I watch the Emirates giant A380 aircraft lift slowly into the air. It was flying to New Zealand now, but when it returns the passengers inside will be destined for Dubai or London. Maybe they should just visit Arncliffe instead. Where is that, the old track going?